Use these findings to help you land those sought-after content marketing jobs and find a good fit in the appealing and growing content marketing world. As you’ve been digging through marketing job postings, chances are you’ve seen the title “Content Marketer” out there. While specific content marketing jobs may be fairly new and unheard of for some people, the demand for these roles is actually growing. In addition to these job openings becoming more common, there has also been an increase in Google searches for these roles. Considering the range of titles and experience levels within the content marketing industry, we asked ourselves: which skills and qualities are employers collectively looking for? 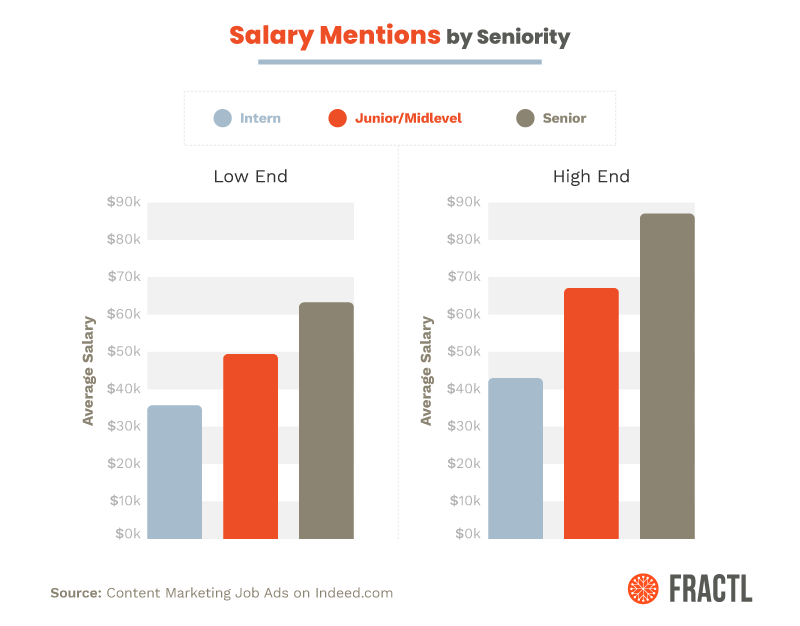 To uncover the trends and attempt to pinpoint the ideal content marketer, we analyzed 1,400 job posts from Indeed.com with the search term “content marketing” in early 2019. Here is what we learned. 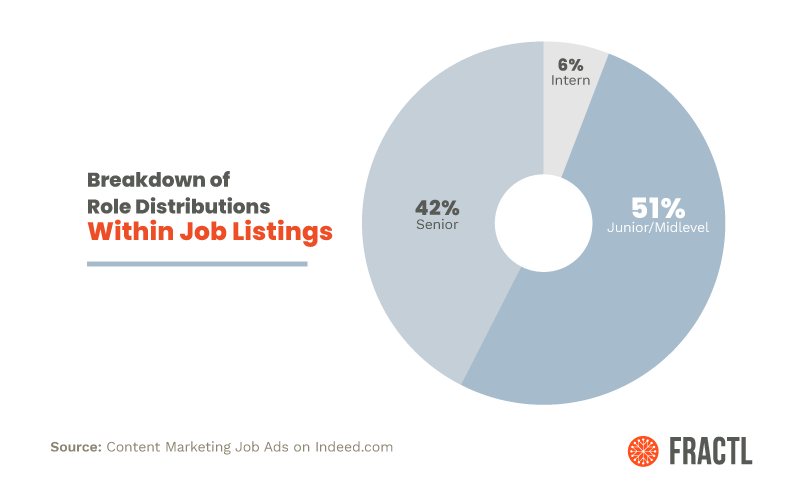 Of the posts we gathered, we had a nearly even split of junior/midlevel and senior-job postings with a small percentage of intern postings within our analysis. We explored the salary ranges for each job level and found that our intern level positions ranged from about $37,000 to $43,000 annually. On the upper end, our senior-level positions made nearly double that range, with salaries ranging from $60,000 to almost $90,000. But what do you need in terms of qualifications to land one of these jobs? One of the first things people will likely consider when assessing their fit for a role is how much experience they have. 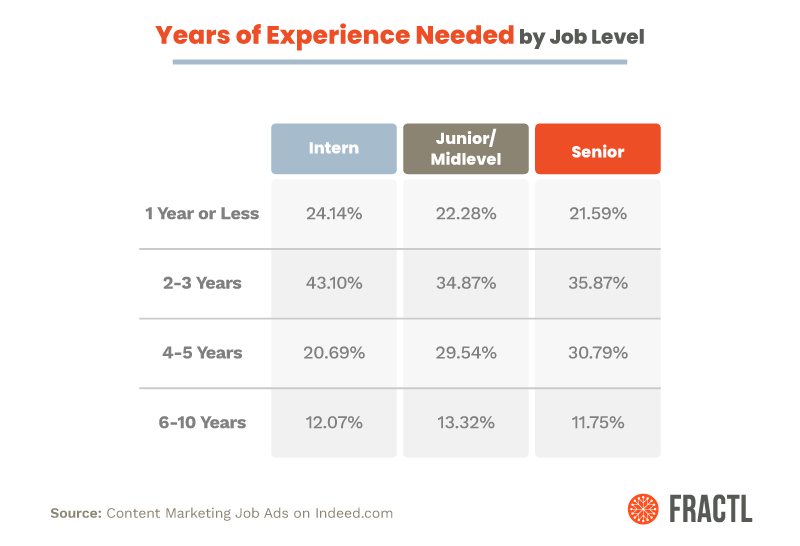 We found that almost half (43%) of our intern jobs asked for 2–3 years of experience, which may be difficult for someone who is new to the industry. Additionally, for the junior and senior-level roles, we found that most postings were looking for 2 to 5 years of experience. To any prospective applicants: don’t be discouraged by the years of experience listed in these ads. There are many qualities and skills that employers look for in entry-level applicants. 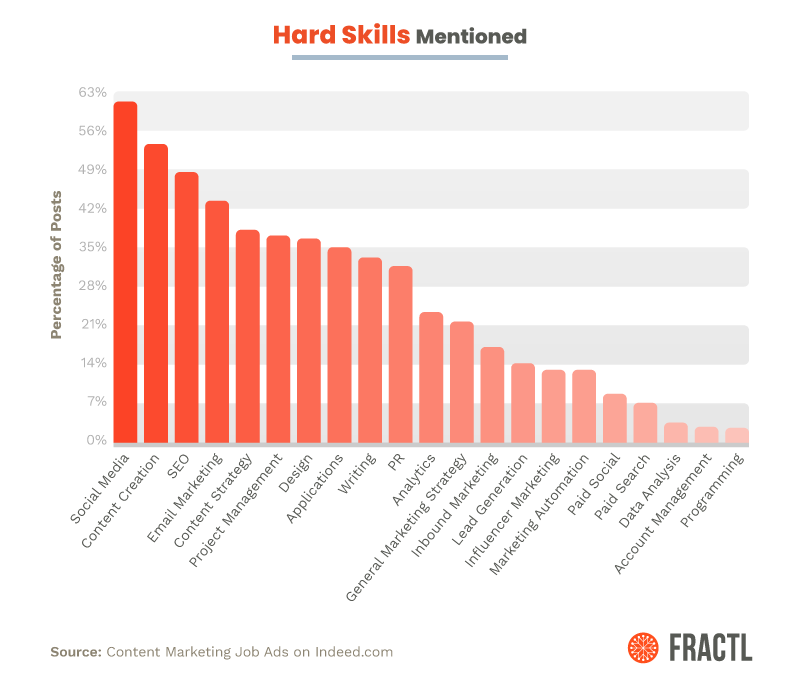 When looking at hard skills, or skills that can be easily measured and learned, most content marketing jobs are looking for people who know social media, content creation and SEO. 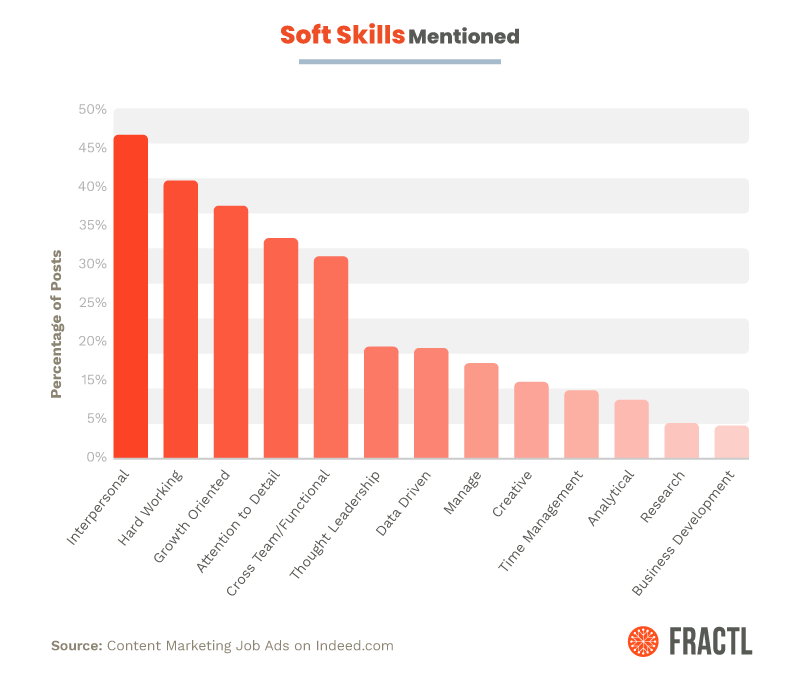 These three skills were the most mentioned throughout all of our postings. So, how do these variables change related to seniority? 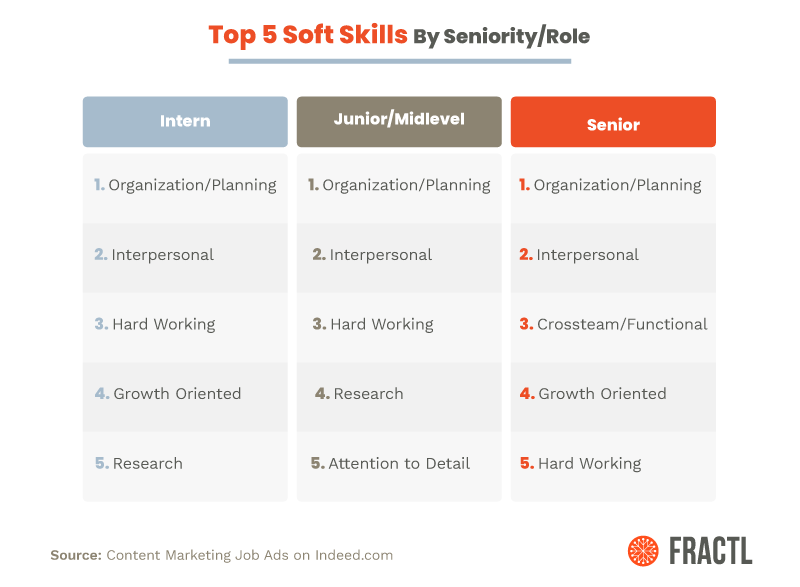 While job listings for all three levels of seniority mentioned content creation, internship roles place their second and third emphasis on knowing different programs and applications as well as content creation. 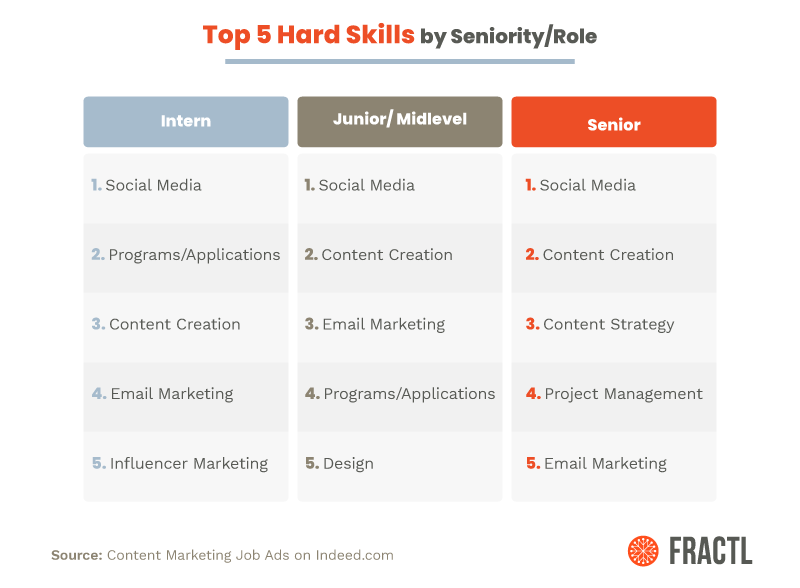 The junior and senior-level roles also emphasize content creation, but junior roles entail more email marketing while senior-level positions place their focus on content strategy. 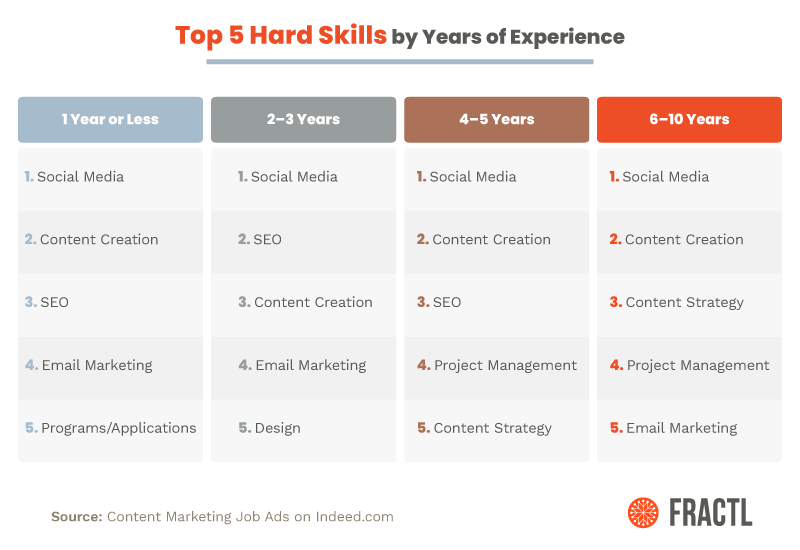 Again, based on years of experience needed, we found that employers placed their emphasis on Social Media, SEO, and Content Creation, except for senior-level roles. They’re looking for someone who can handle Content Strategy as well, which aligns with the desired skills for senior roles. With a strong focus on content creation among all job levels, we looked to see what the different job levels expected their applicants to be capable of in this department. Internship roles place importance in having experience crafting social media content and blog posts, while the other job roles don’t. 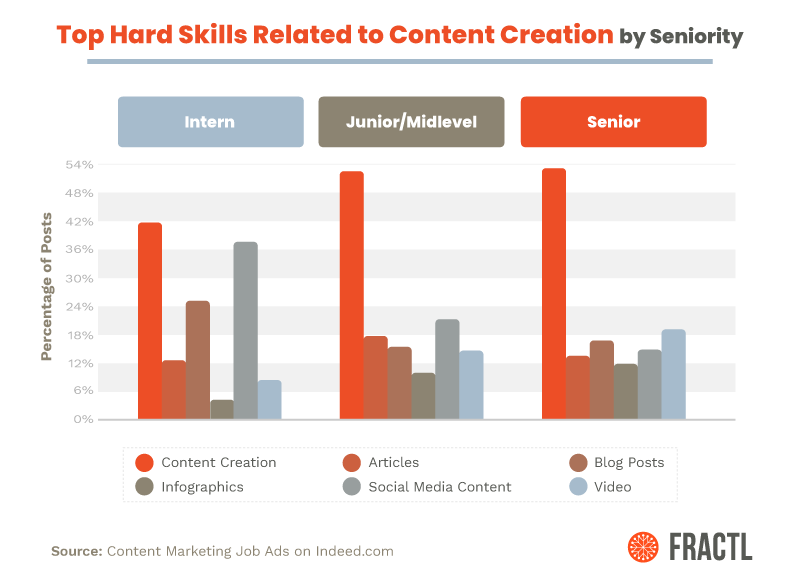 Higher-up jobs have more of a diverse focus, with general content creation being the most important and an emphasis on the other skills being evenly distributed. As we know, there’s more to applicants than just their technical skills. We also looked at the soft skills employers mentioned in their job listings, or skills that represent qualitative abilities in the workplace. Overall, employers are looking for applicants who have strong interpersonal skills, are hard-working, and growth-oriented. While these skills are hard to quantify, they are still important to emphasize to potential employers. Use anecdotal examples to prove you embody the qualities top recruiters are looking for. Generally speaking, there isn’t much deviation between the top soft skills between different job titles and levels. The biggest takeaway to remember here is how the definition of these skills change as an employee changes titles and their responsibilities change. As an intern or entry-level employee, your soft skills are often applicable to yourself and how you handle your day to day interactions. Your focus is more on personal growth and adjustments as interns likely don’t have to navigate through different departments. As you progress up the ladder, interpersonal skills expand with experience communicating with many team members. Additionally, organization skills begin on a micro level but will continuously improve with better systems and more integrated means of tracking progress. 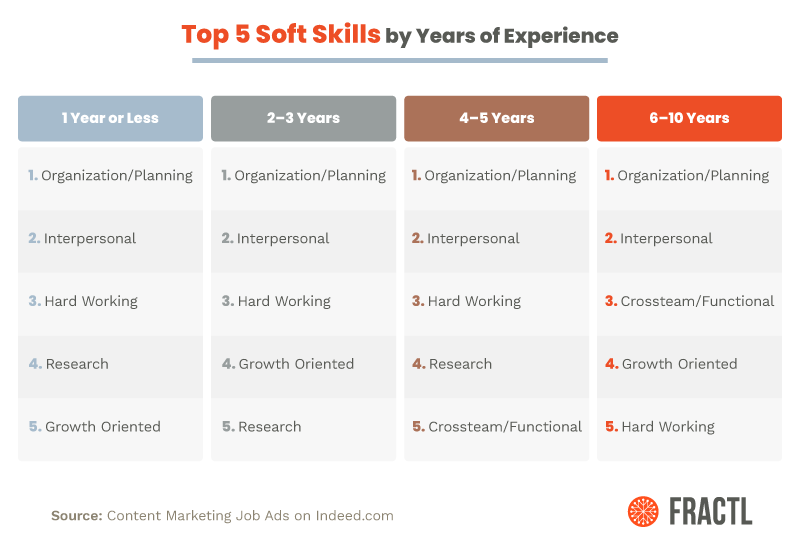 When we measured these top skills by total years of experience that these jobs are asking for, the trend remains the same: while some skills are unique to different levels of experience, most employers are seeking applicants with a honed-in skillset. The years of experience mentioned and the skills desired are similar among all groups, but the specific definition of each skill changes as you progress through the rankings and shift your focus from self-reflection to thinking about the big picture. Overall, a quality applicant possesses a mix of all of the skills we found that employers value. Collectively looking at the most and least mentioned skills across the board, we found more of a technical and skills-based emphasis for intern-level jobs, while senior-level jobs focused more on soft skills such as management, and leadership skills. This occurs when senior-level candidates exemplify their management and thought-leadership skills on a regular basis and lower-level employees don’t have the same opportunities to practice those skills. It’s not that senior-level employees don’t need the skills like Microsoft Office, Photoshop, or social media—they’ve already learned those programs and apps when they had less experience. They are expected to understand those topics well. Interns are expected to build on their base knowledge and focus on education. 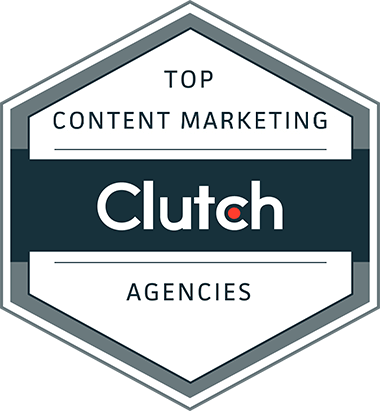 The content marketing industry is growing, with more agencies expanding their services to include this offering with each passing year. Companies are seeking to add people to their teams who can lead these initiatives and bring their marketing departments into 2019 and beyond. This a new and growing industry subject to changes and evolutions in technology, so don’t let the laundry list of experience and requirements turn you away from a good job opportunity. 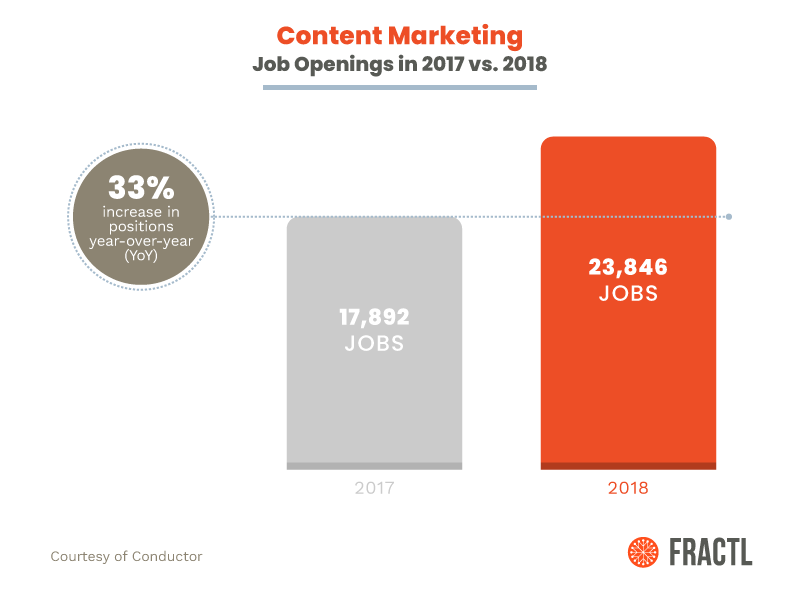 Use these findings to help you land those sought-after content marketing jobs and find a good fit in the appealing and growing content marketing world. 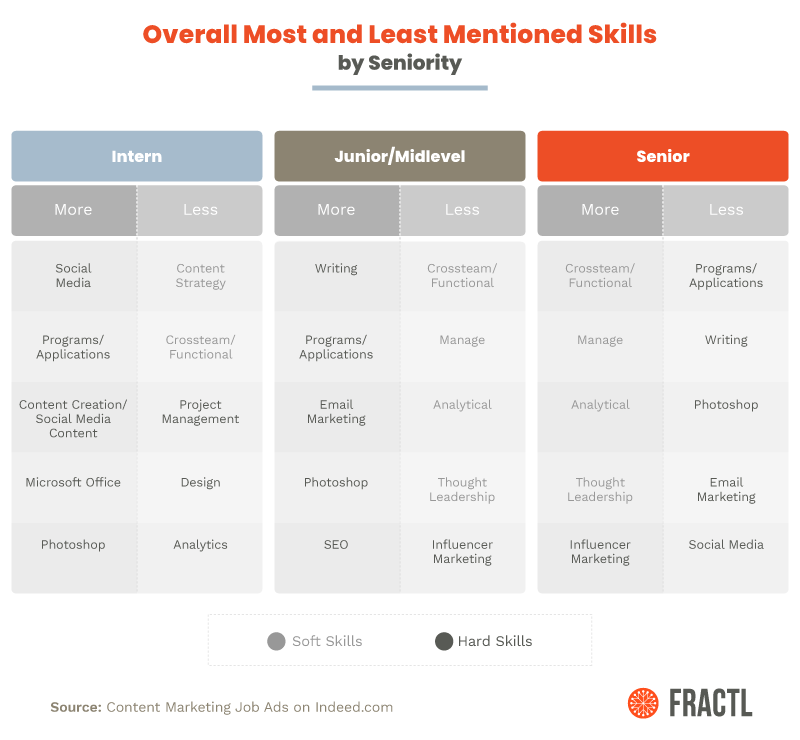 The skills these job listings mentioned are key to understand what the ideal content marketer looks like and Fractl values these attributes as well! Learn more about us and how we produce results for our clients! 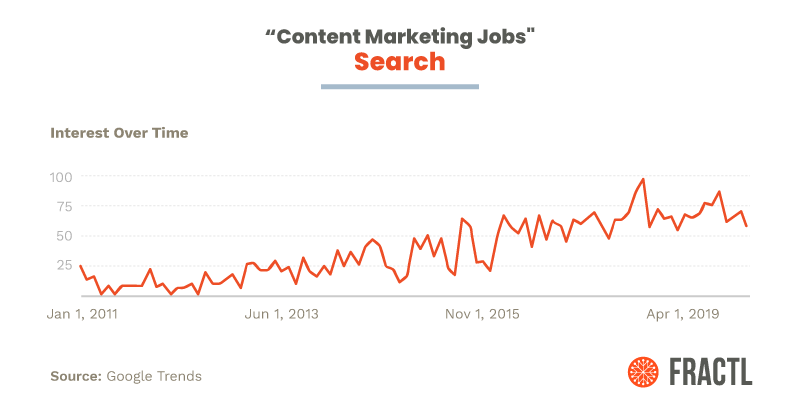 We scraped 1,400 job posts from Indeed.com during the week of January 6th-January 12, under the search term “content marketing”. Once we had our results, we used WordStat to analyze the text within the job postings. Job posting titles were then grouped by hand into the hard skill and soft skill taxonomy we created. Subsequent frequency and correlation analysis was done with Wordstat. For minimum years of experience required, we searched for any mention of the word “years” in the job description section of each posting. We omitted any number of years in close proximity with the word “preferred,” and we used the lowest number mentioned as the minimum years of experience required. Because some positions list years of experience for several competencies, this method may have skewed the required years of experience down, especially for senior-level positions.